ATDB • View topic - Qantas Aboriginal livery planes for "fm2790"
Qantas Aboriginal livery planes for "fm2790"
I had a request from fm2790 for the Qantas planes with Aboriginal livery. Not sure which one, so here's some photos - unfortunately I don't have a picture of the beautiful blue Nalanji Dreaming which is being used as a parts plane and awaiting scrapping at Avalon. Re: Qantas Aboriginal livery planes for "fm2790"
I could probally get you one of the blue ones, Because I actually fly that aircraft sometimes. Next time I do I will get you one. GeneralBus wrote: I could probally get you one of the blue ones, Because I actually fly that aircraft sometimes. Next time I do I will get you one. Terrorising the Streets in an SL200! Here's Nalanji Dreaming, courteousy of Airliners.net. I'm surprised GeneralBus didn't beat me to it. Denning-6V71 wrote: Here's Nalanji Dreaming, courteousy of Airliners.net. I'm surprised GeneralBus didn't beat me to it. HaHa very funny, even though I dont even Know what airliners.net is. Really?? How could you not know about airliners.net? All the best airline pilots go there to discuss matters of vital importance to the global aviation industry on the forums there. 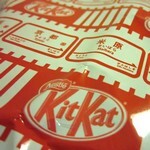 Sorry for late reply Kit Kat. Nice photos. What ever happen to the 737800 one? is it still around? Yanayi Dreaming - VH-VXB is still around. Was in Canberra just the other day.